Wedding are very special times, so why create a gift that is just as special and unique as the happy couple! 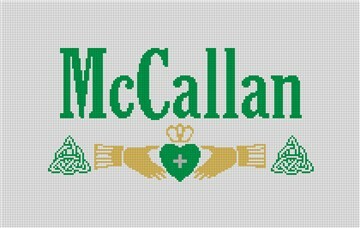 This Irish wedding pillow could be a ring bearer pillow if stitched on 18 mesh (10" x 5.8"), or a full size pillow (18" x 10.5") if done on 10 mesh. The design features two Celtic knots and the Claddagh ring. Enter the last name of the family and we will make a preview of your canvas. The colors can also be changed to your preference.